I removed Hurdy Gurdy Man as per Dime rules as it was quite obviously the released version. I guess they went all out on those crazy 60's visual effects for this song, strobes, psychedelic colours, camera zooming in & out rapidly. This show exists in the TV archives so hopefully might get rebroaadcast one day. On the plus side I was able to use the removed song as reference for speed correction. This does not exist in the archives. It was wiped by the BBC sometime in the 70's. This and the reel from which it came could quite possibly be the only existing copy. Time to set it free. I don't know much about James Taylor but after doing some googling I realise this is pretty early, and could quite possibly be his first UK TV appearance. It's possible he's playing guitar on "Refractions" but I don't know, maybe a James Taylor aficionado can tell me once they've heard it. The only song title I was unable to identify was track 12 so I made up a title and called it "Sandman's Comin'". I was able to find all the rest by googling but couldn't find this one at all. Maybe it's an unreleased/unique song? In track 7, the John Cameron she mentions was the Musical Director for the show. He had a band The John Cameron Quartet. They were probably the house band for the show. During the song, Pan's People danced to it. They were a dance troupe and were regulars on 1970's episodes of Top Of The Pops. Both shows would have been pre-recorded not broadcast live. Thanks Moondroog. That was more then I expected. The complete "Basement Tapes" ? My archive system is all whack (see the archiving thread), so I haven't found it yet, but I'm pretty sure I know where it is now. I can upload on Friday. Don't go to any trouble, man, honestly! If you happen to find it ... either (FLAC or MP3) is fine. Thanks a lot. Really. Even, don't worry about it, man. Thanks again, Alan. These are the links at Expecting Rain - they still work by the looks of it! Anyone have the briefly released instrumental version of Lumpy Gravy - there seems to be some confusion about whether it was a Capitol 8-track or a Muntz 4-track cartridge. 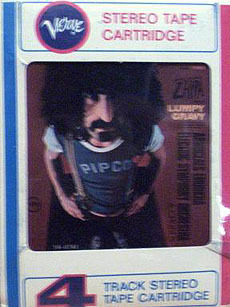 According to Zappa himself, this version of Lumpy Gravy is one of the rarest official Zappa releases - if not the rarest. It contained only orchestral music, and none of the dialogue or band music. Yeah, I've got that. I've got the standard mono version too. "Just because I only have one leg doesn't mean I'm a CHUMP, man!!!" Ha ha, LOVE that avatar! I guess Brian's next "rock 'n roll album" will be made with Phil Spector, NOT Paul McCartney (or Charlie Watts by that matter! )!